Here is the Congress which provided the final chapter on all development to date and the beginning of an entirely new era! For with all the discoveries the past year had brought—in terms of clearing—they had now culminated in a breakthrough for planetary expansion. First, L. Ron Hubbard reveals the single reactive postulate at the core of planetary apathy, “there is nothing I can do about it.” Yet that postulate doesn’t stand a chance—not with what he next discovered. Stemming from the pervasive datum, “the confusions aren’t and order is,” came the discovery of the senior ability of a thetan. In fact, once a being reaches the top of the scale, it’s the only thing they can do. It’s a datum that provides the answer of how an individual can consecutively and continuously bring wider order that spreads like a wave over the world. 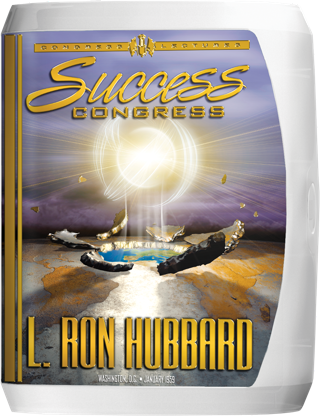 And that’s the substance of why Mr. Hubbard began this Congress where they usually ended: The Future of Scientology. 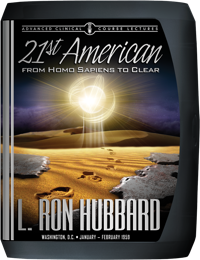 For by the final, and now legendary lecture, he had provided the means to attain that rarest of qualities, yet one inherent in every Scientologist, and required for a new civilization: Leadership. Three subjects, not one, have been in development in Dianetics and Scientology for these many years. First and foremost, of course, is Scientology itself. Second is Organizational Know-how. Third is How to Train Auditors. Yet as 1958 came to a close, that first subject of development—Scientology itself—had resulted in a breakthrough that would coalesce all three as the concluding chapter of every development to date…and the beginning of an entirely new era. “The single largest technical gain in eight years has just occurred. And while the full story of that breakthrough is provided elsewhere (London Clearing Congress), L. Ron Hubbard’s discovery of the true nature, anatomy and source of mental image pictures prompted him to review his earliest procedures of clearing—those of 1947 when he made the first Clears—even predating Book One. No sooner had these discoveries been announced than he began a new course, the 5th London Advanced Clinical Course (ACC). Lecturing, supervising and working with trained auditors, he tested the latest technology of Scientology in handling Dianetic engrams. Results were immediate. Not only did the speed of clearing increase dramatically, but those new discoveries had resolved the earliest barrier to Dianetic auditing—the occluded case. Indeed, there was not one preclear who didn’t regain past life memory and that’s why the case histories of the 5th London ACC soon resulted in the book, Have You Lived Before This Life? And finally, there was the last frontier to truly global expansion: organizational know-how. In that regard, his new discovery concerning mental image pictures had revealed something else, something even greater—the anatomy of confusion and order. For as he next demonstrated in application, here was the most rock-bottom basic in bringing order to a preclear, an organization…an entire society. Therein lies the story of how these three subjects—Scientology itself, training of auditors, and administrative know-how—coalesced to provide the answer to the creation of a new civilization, as contained in Mr. Hubbard’s legendary lecture, “Leadership.” Because contained within that lecture is the inherent responsibility of every Scientologist, as a leader, and the means to achieve its hallmark quality. Indeed, it is a lecture of such importance L. Ron Hubbard had it immediately copied and distributed to every auditor on Earth. All told, when the Success Congress was over an entirely new era had begun. After all, the next time Scientologists assembled at a Congress to hear from L. Ron Hubbard, it was monumental: The announcement of technology for wide scale clearing, hundreds or even thousands at a time—by one auditor. Welcome, then, to Washington DC’s Shoreham Hotel, January 1959.